Don't you hate it when papers, memos, reminders, bills are scattered in places they don't need to be? I know that feeling all too well. I decided that we needed a centralized place where all of this can be stored in a fun and exciting way! My pet peeve is walking into my living space that is left untidy. 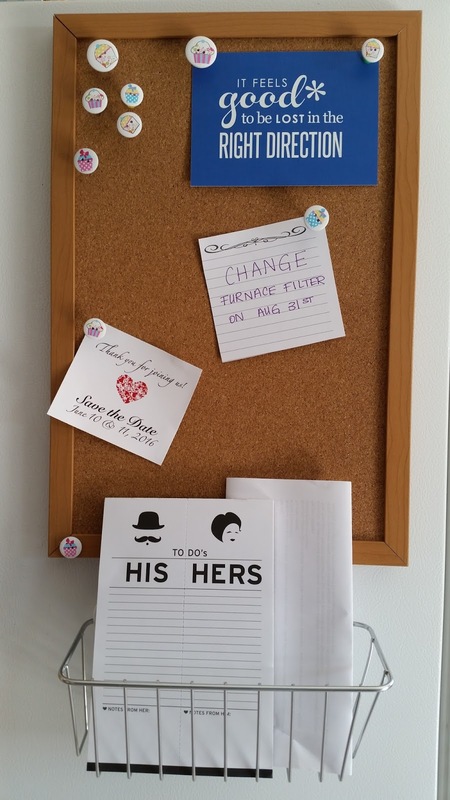 At one point, I had bills and random memos lying in a pile on the half wall in my kitchen and I decided that enough was enough! I needed to solve this issue ASAP. 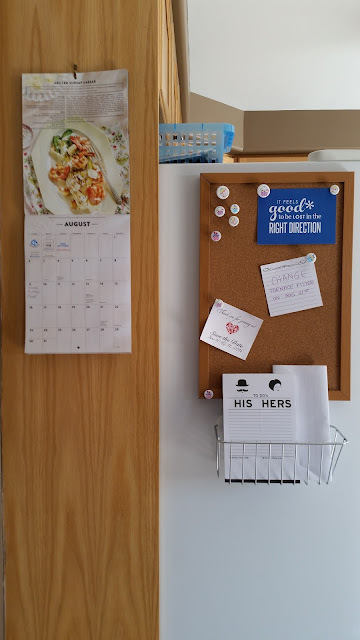 So, I did some research on Pinterest and came up with this nifty idea for a DIY message center in my kitchen! For this DIY project you will need a cork board, paint, a paint brush, some magnets, a hot glue gun, some push pins, a few decorative buttons and a shower caddy with strong suction cups. Start by painting the frame of your cork board with a colour of your choice. I chose to leave mine au natural. Once the paint is dry, glue on the magnets to the back. 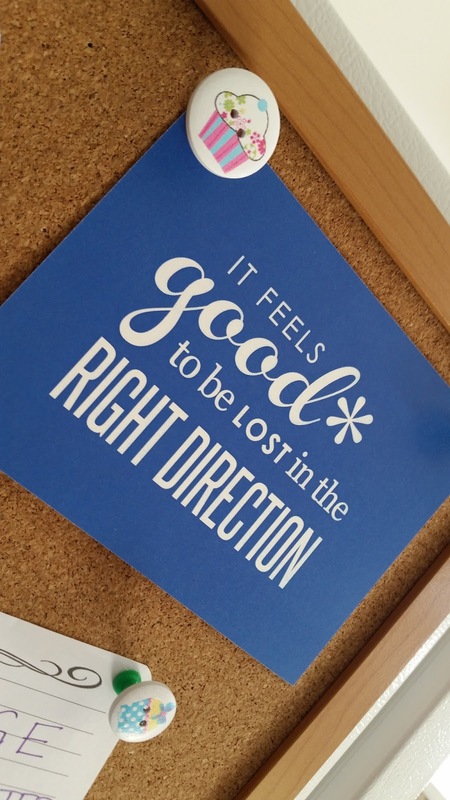 Ensure that the magnets can easily hold the weight of the cork board. In the meantime, glue on decorative buttons to the top of your pushpins. Makes things more interesting and exciting! 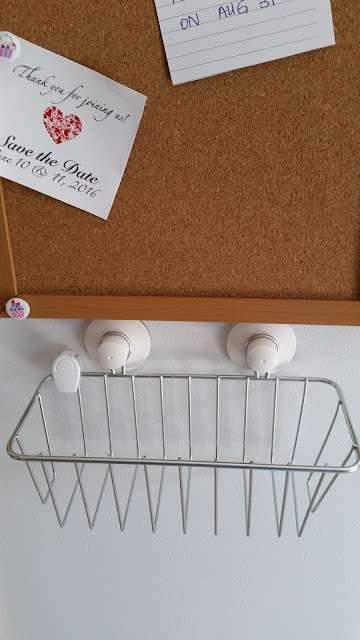 Once everything is dry, you are ready to hang the cork board on the side of your fridge. Right underneath, attach the shower caddy using the suction cups. (I got mine from IKEA for a great price!). It makes life so much easier! All of my papers, important memos, invitations, bills etc. are now in one neat little spot. I no longer have to go on a hunt on my half wall to find something. 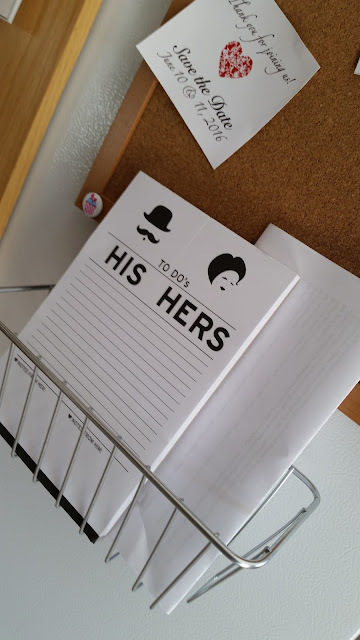 I like that it's in a common spot so that my husband and I can see every time we walk past it. We can both go to this centralized spot to view upcoming reminders, to-do lists or invitations to events. It also adds a quirky touch that I love in our kitchen! We spend so much time in here, so it's important to add a personal touch and I definitely think that this was achieved with this DIY project.